grave with sorrow and bitterness, because all her 5 children rejected her and efforts to see them had been abortive. She said, “I had 10 children. While 5 of them died, 5 survived. My husband died about 20 years ago. I was formerly living in the Alagbado area of Lagos State, but my son, Sola, chased me out." She added that anytime she called her 4th child, Samuel, a lawyer, he always gave excuses of being in court, promising to call back, without doing so. Bolaji, who explained that Samuel prevented her from knowing his address, said other children also gave excuses instead of catering to her. When asked about her siblings, she lamented that they had equally forsaken her. Bolaji said she later moved to Ladipo, Oshodi where an old friend, Mrs. Sadatu Ahmed, has been sheltering her for the past 8 months. Bolaji survives on a weekly N2,000 stipend she receives from the MFM every Monday. However, her son, Samuel, on the telephone, said his mother was troublesome, adding that he kept her away from his family to avoid having issues with his marriage. He said, “She was formerly living with my elder brother, Tope. She was always quarrelling with his wife to the extent that they would engage in fisticuffs. And it was regular. She cannot live with any of her sons without having issues with their wives, so we are trying to make enquiries about old people’s home for her because that is the next step. Just last week, we all contributed N25,000 to give her; so I wonder where the issue of neglect is coming from. My wife and I are too busy and if she stays with us, she will still complain of neglect. 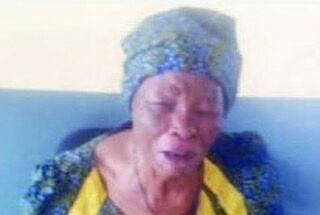 It is not important that she knows where I stay; the most important thing is that she is taken care of.” Samuel said although he didn’t know who she stayed with in Lagos, he sometime sent her money through his wife.